Get Rid of Heel Spur – A heel spur is when you experience pain on your heels after walking or standing for prolonged hours. A pointed bony outgrowth rather a calcium deposit causing a bony protrusion on the underside of the heel bone is what we term heel spur or osteophytes. Remember immediate attention is obligatory to avoid serious problems. What are the Causes of Heel Spur? The heels of people such as athletes, sports persons who walk or run on a regular basis are subjected to friction. This can in turn result in damage to the tissues. In order to protect the tissues from damage, cells called osteoblasts dump calcium in these areas which leads to the development of heel spurs. Walking step abnormalities, which place too much stress on the heel bone, ligaments, and nerves near the heel. Jogging or running, particularly on hard surfaces. Poorly fitted or badly worn shoes. Often times, there are no symptoms at all. You might only have an intermittent or chronic pain in the heel while walking, jogging, or running. There can also be swelling and redness of the foot as well. If you feel a knife or pin poking type pain at the bottom of your feet when you first stand up in the morning and the pain that later turns into a dull ache; it could be because of a heel spur. Who are at Risk of Developing Heel Spur? 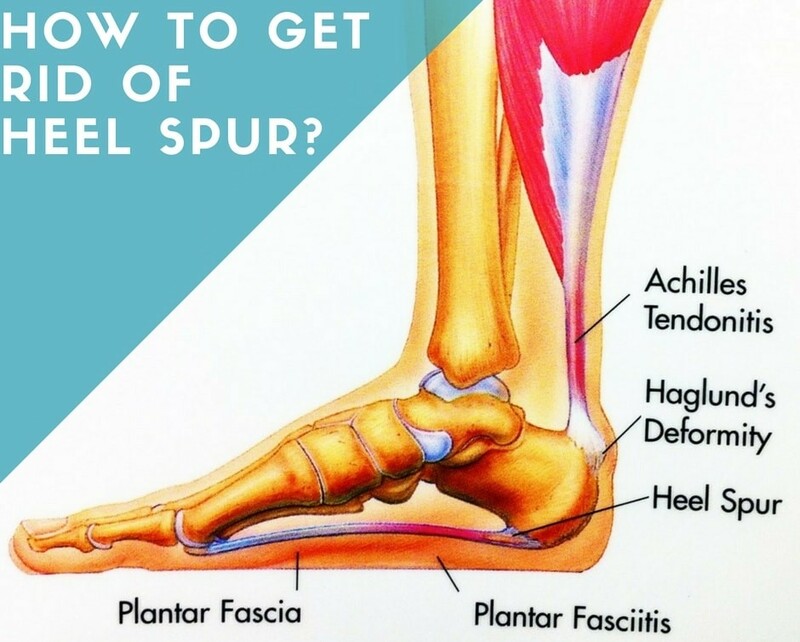 How To Get Rid of Heel Spur? If you are looking for natural treatments to relieve the pain, try the following home remedies as they are proven to have contrastingly fewer side effects or none at all. They are also much easier to fit into daily life as compared to the time draining treatments. This is a very effective remedy for treating inflammation caused by the bony outgrowth. Take a little warm coconut oil and gently massage on the heels. The massage will improve the blood circulation. Long term practice will give relief. Cabbage leaves help in the reduction of pain associated with this condition. Take a few cabbage leaves and soften them by holding close to a low flame. Now place these soft cabbage leaves on the heel and cover it with a clean cloth. Leave it on for few hours. Use only fresh cabbage leaves for this remedy. Apple cider vinegar is found to effectively reduce pain and swelling caused by the bony protrusion on the underside of the heel bone. Soak a clean cloth in apple cider vinegar and tie it around the affected area. The remedy needs to be followed till you get relief. This one helps get rid of the pain really fast and gives temporary relief from inflammation. Take a few ice cubes and wrap in a clean cloth. Apply the cold compress to the affected area and hold it for some time. Follow the remedy three to four times on a daily basis. Baking soda is found to provide relief from the symptoms of heel spur and effectively helps in reducing the size of the heel spur. Mix baking soda with a little water to form a thick paste. Apply the paste to the affected area on a regular basis. Take a glass of water and to it add a little apple cider vinegar and a small amount of baking soda. It will help in maintaining the body’s pH balance thereby treating heel spurs. Magnesium is a vital mineral for bone formation and utilization of calcium. A warm bath with Epsom salt. It gives a very soothing and relaxing effect. A mixture of borax (an alkaline compound) and chlorinated water plays a significant role in reducing the pain. It helps to uphold the levels of hormones and minerals essential for bone health. Add a little borax solution to warm water and soak your feet in it for a few minutes. Also read : How to Get Rid Of Leg Cramps? You can have ginger and turmeric on a daily basis to get release from pain and inflammation as they both have anti-inflammatory properties. Add crushed ginger to boiling water and let the mixture steep for few minutes. Strain the solution and have the tea on a daily basis. Must read : How To Heal Cracked Heels? Crush mustard and apply it to the affected areas. Not only does the ache fade away, but blood circulation improves too. These are derived from the same plant and contain alpha-linolenic acid, a type of omega-3 unsaturated fatty acid. Dip a cloth in warm oil and wrap around affected foot. To stabilize the dressing, envelope with plastic wraps. This will keep it warm. It is, however, important to practice yoga postures under the supervision of a trained Yoga teacher. Avoid taking too much stress. If you feel stressed out, resort to remedial measures against stress such as meditation, yoga etc. Make sure that you wear proper fitting and comfortable shoes that do not put unnecessary pressure on your heels. Avoid a sedentary lifestyle and engage in regular exercise. Should you find yourself suffering miserably with heel spur, remember that with proper preventive measures, you can easily get rid of it. Please share your experience on the natural heel spur healing measures. Or should you have any other home remedies for heel spur treatment; please let us know. Henna for Greasy Hair - How to Apply Mehndi / Henna on Hair?